This past weekend (plus Monday and Tuesday) my family and I took a trip to Las Vegas. Hope students had the two extra days off for Winter Break and my mom wanted to take advantage of what might be the last time my family is (mostly) all able to get together for a family vacation. We flew out on Friday night, which ended up about three in the morning Detroit time in Las Vegas. That Saturday we visited the Strip, which is the long stretch of hotels, casinos, shops and restaurants. At night it feels a lot like Times Square. The hotel lobbies in Las Vegas are extravagant. I found myself looking at the scenes of replicated cities, monuments, places and wondering whose idea was this? I’m sure whoever decided that Las Vegas would be what it is today had money on their mind. The next day we visited the Grand Canyon in Arizona and the Hoover Dam on the way back. Those are two landmarks that simply awe you in their presence. One land-made and one man-made, I couldn’t help but wonder how it all happened. I also got to see a Cirque Du Soleil show that night… and you bet I was wondering the exact same questions as I did when I saw the Strip, the Grand Canyon and the Hoover Dam. On our last day, Monday, we sat by the pool and explored a more rural Las Vegas at a local mall. The contrast between the bustling downtown and the quiet mall was strong. 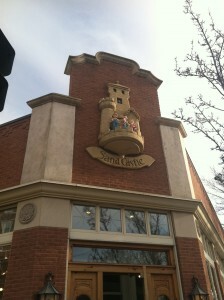 It felt just like an outdoor mall back at home. Our plane was scheduled to leave that Monday night, but ended up getting delayed and canceled at three in the morning Las Vegas time. We finally got a ride back the next afternoon, and my mom dropped me off at Hope this morning, just in time. While my last 24 hours have been exhausting, the trip was well worth it. Las Vegas isn’t really my city, but it’s definitely an experience that you should have. The same goes for the Grand Canyon and Hoover Dam. (And the Cirque Du Soleil. It’s on my list of top ten favorite things, ever). 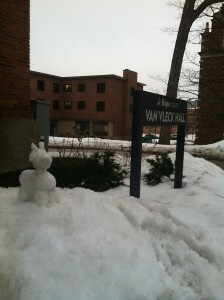 This past weekend was Winter Break at Hope College, and it was the best weekend ever. My friend Ashley and I remained on campus for the break so we made a list of all that we wanted to accomplish over the four day period. Here are the highlights of our adventures. Friday afternoon the campus population decreased as we pulled out the baking supplies and made cupcakes. Ashley using the hand mixer that mixes when it wants to. My roommate, Kristin, enjoying a cupcake before she heads home for break. Later that night our friend Ellie came over to Van Vleck and we had Lilo & Stitch Movie Night. We watched Lilo & Stitch, Stitch Has a Glitch, and we decorated cupcakes! Disney + cupcake decorating + friends = a Fabulous Friday Night. Ashley holding a happy Kalvin now that his friend is home. After lunch we walked the boardwalk out to the beach. Ashley enlightened me on the awesome beauty that is frozen Lake Michigan. We walked on the frozen waves and made our way down the ice covered pier as I took way too many pictures because everything just looked way too cool not to photograph. If you have never seen frozen Lake Michigan I highly recommend making it happen some day because I am still amazed by the forces of nature that created such a landscape. On Sunday we built a snow goat. His name is Gilbert. 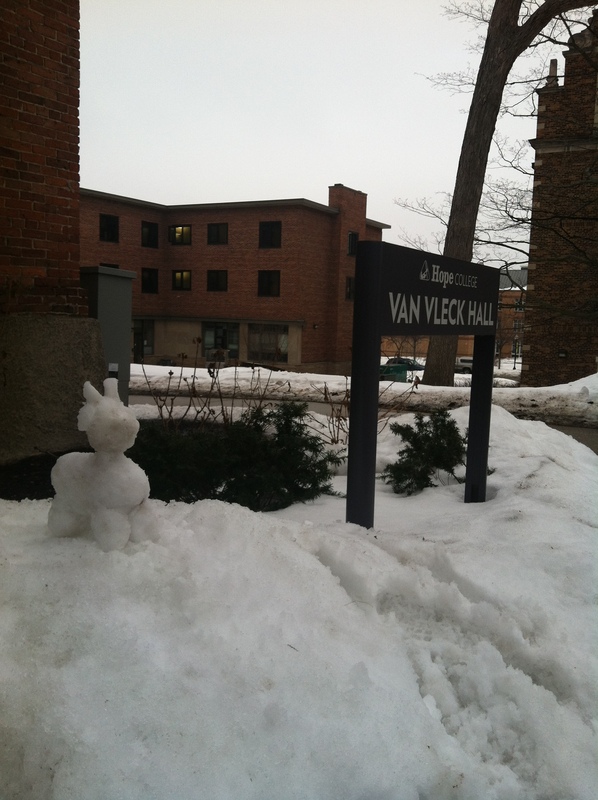 He lives outside of Van Vleck. Sunday night we again visited with Ellie, this time at her house, to play Mario Kart, watch even more Lilo & Stitch and then we made a puzzle. 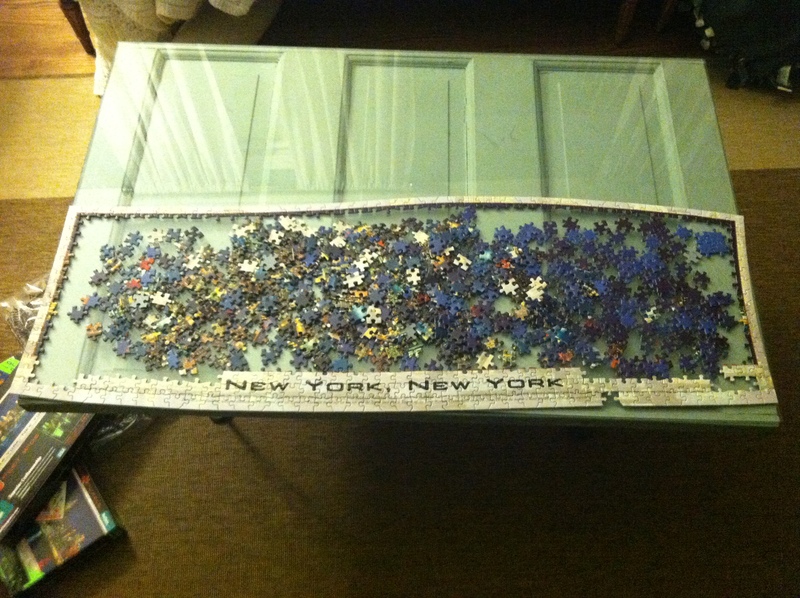 Our pro puzzle skills created this work of art. Looks just like NYC, right? 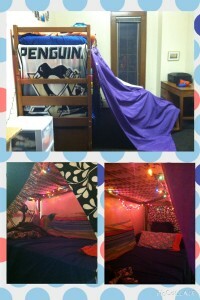 Monday night we discovered the real reason most college dorms have bunk beds: Blanket Forts. We built our fort then watched Frozen and my favorite movie, Miracle, from within its cozy shelter. Also, the ceilings in Van Vleck are perfect for finding animal shapes in if you ever happen to be lying on the floor of a room and need something to do. Here are a few of our favorite animal finds in Ashley’s room. 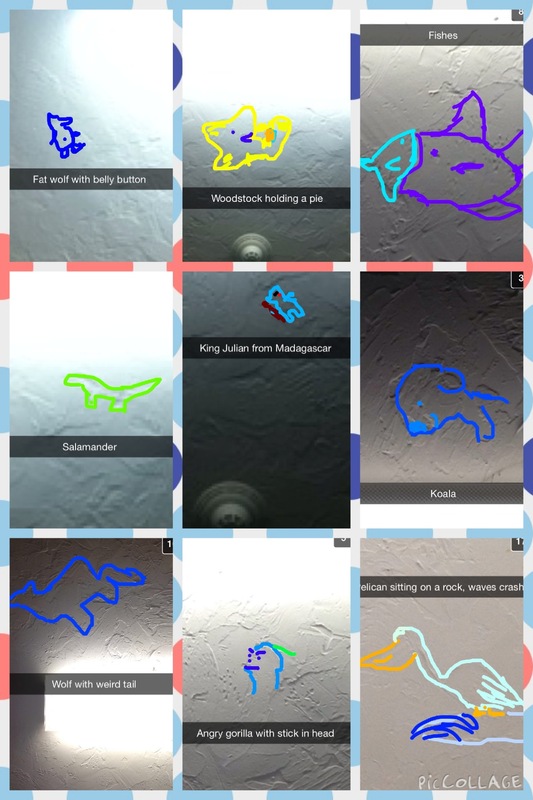 Snapchat outlines of all the ceiling animals we spotted in Ashley’s room. Tuesday, our final day of Winter Break, brought blue skies and sunshine so what would be better to do than pull out the hammock and head out to the Pine Grove? We had our first experience of putting up a hammock and it didn’t crash to the ground so the experience was a success. We bought tea, were asked if we wanted the big cups, and agreed cause why not, right? I’ve never been given that large of a styrofoam cup before. JP’s and Ashley and I with our giant cups of tea. 20 oz. of tea later we headed outside and ambled down 8th Street stopping in a shop here and there to explore. Holland has really cute shops, but our only disappointment was that none of them sold Slinkys. Not even Sandcastle, the cute toy shop on 8th street, had sliknys. Nevertheless, we had fun looking around it anyways. Tuesday night came and the campus population began to rise once again and we said so long to choice seating in Phelps and days spent adventuring without a care towards homework. 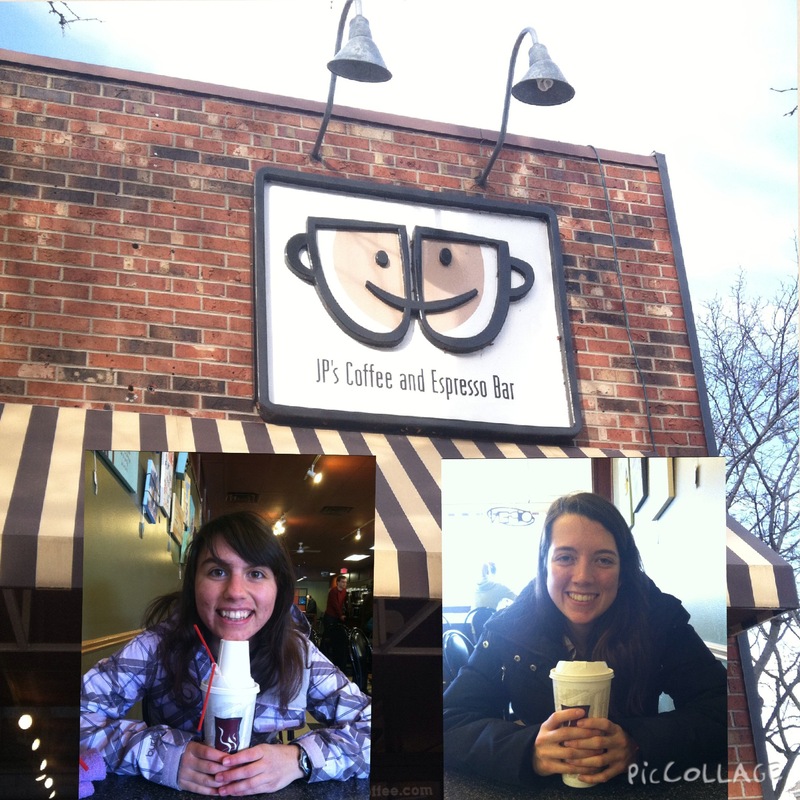 Our Winter Break Adventures were a success. You can follow me on Twitter (@HopeErin18) and Instagram (@e_delaney333) for more little updates on life at Hope through my experience. Adventure IS out there. Sometimes you just got to create it yourself and keep a keen out for it. Over Winter Break (02/07-02/10) I went home for a wee bit and brought my friend Christian along with me. My home is located in little ol’ Tipton, Indiana – population of 4,992 (thus about only 1000 more people than students at Hope College). It is a place full of corn fields. So, it is fair to say that we had to do a bit of searching to find the adventure, but we found it. We first got to my house on Friday evening. We came home to a nice dinner and a then played some cards with the family. Then Saturday rolled around, or better labeled, Adventure Day. We woke up to some more good food and then set off. We first walked to a woods and explored in there. We then went to a silo that had a large connection to my childhood. Then we headed back to my house and walked on the frozen pool, which nearly gave my grandma and mother a heart attack. Then we went into town. We snuck into the high school, did some shenanigans, and then went t the park to adventure some more. We ended the adventuresome day by going to the Turbine Farm that was right besides my house and did some exploring. All in all, it was fun. It also helped me realize something. Ever since I have come to college and the beautiful town of Holland, my enjoyment of Tipton, Indiana, has lessened. Holland has so much for my extroverted-self to do, where Tipton is a place that doesn’t really fit my personality. Due to that, though I do love being with my family, I have unconsciously had some negative feelings towards Tipton and thus slightly avoided it. This break allowed me to let go of some of the disdain towards the town that I was born and raised. Sure, I don’t ever expect to live in Tipton after college, but I do now know this, Tipton is more adventuresome then I thought. I guess that maybe I just wasn’t looking in the right places or maybe even looking at all. For more about me, follow me on twitter @hopejohnluke17 or on Instagram at johnlukehawkins. If you have a question you can email me at john.hawkins@hope.edu. Until next time! TGIF. I never knew this day would come. Okay, Fridays always come, I’m just over-exaggerating. Many exciting things happened this past week, and more exciting things are going to happen. Want to know why? Because WINTER BREAK IS AROUND THE CORNER! Truly exciting. Okay, so I want to share with y’all what I did from last Friday until today; like a ‘Week in Review’ dealio. A week ago today, I had my first Hibachi experience. Yes, I’ve been to plenty of Japanese restaurants, but I’ve never fully experienced Hibachi, when the chefs cook the food in front of you. Talk about a tease. I was sooooooo hungry by the time our chef was cooking, all I wanted to do was eat, but his dazzling display of skill and talent was well worth it. I just want to take the time to thank my friends who made these plans. In the slideshow at the bottom of this post, there’s an artsy picture I took. Obviously, last Sunday was the Superbowl. A bunch of my friends, including Chelsea Barfield, fellow Hope blogger, went to our family friend’s house, the Winters. They are so nice to have us over all the time. Seriously, if you’re reading this – YOU ROCK. Anyways, we enjoyed each others company, great food, and interesting game… if it was a game, to say the least. In the slideshow below, there’s a picture of me and my friend Alex with brownies on our teeth to make us look buck-toothed. It’s kind of a weird tradition started my freshman year. Classic me; goofball. For my Maternity clinical, we are required to have a periopertative experience. For those of you who don’t understand medical jargon, periopertative means the entire surgery process; pre, intra, and post. You know how PERImeter means around something? PERIoperative represents the same idea, all around the surgical process. Anyways, it was such an exciting day. 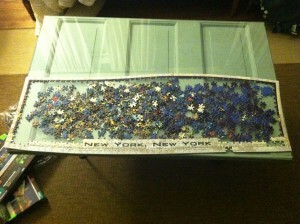 It started at 0645 (sorry, I’m used to military time now). You might think that’s early, it is, but for surgery, I’ll do anything. Once I got to the hospital, they welcomed me, and had me change ASAP so I can start my day. I chose to be with the ENT surgeon (ears-nose-throat). He seriously had back-to-back-to-back-to-back surgeries. He was so fast. Because of this, I observed 10 surgeries that day. It was super exciting to say the least. I’ve truly never explored surgical nursing – but after this awesome experience, I’m thinking about it!!! I’m oh so glad it’s break after my class today. Although I should be relaxing, I will be partaking in many homework assignments and getting ahead so I am in tip-top shape for what’s to come this semester. Also, if you didn’t know, THE 22ND WINTER OLYMPICS STARTED YESTERDAY IN SOCHI, RUSSIA! I watched it literally for 4 hours. Tonight at 1930 (7:00 p.m.) is the opening ceremony. Here is a link to get you PUMPED. And then when I’m not watching the Olympics, I’ll be watching my new favorite TV show, Parks and Recreation. Well, here is that slideshow I promised! I’ll definitely be posting something during break, so be on the lookout! Life is good. As I sit here and reflect upon the past week, I feel so incredibly blessed with the opportunities God has blessed with at Hope College. First of all, thanks to the kindness of our parents, Grace and I were able to spend winter break in Marco Island, Florida. We left on Thursday for Chicago and woke up at 4 am to fly to Florida on Friday morning. We arrived in Florida with the sun beaming down and palm trees lining the sidewalks. We stayed at the Marco Island resort and spa. Our room was incredible, because we overlooked the pool and viewed the ocean. A typical day for us included waking up naturally around 10 am, working out in the fitness room, laying out reading some great books, swimming in the pools, meeting new people in the hot tubs, walking along the beach at sunset, cleaning up for the evening, enjoying a nice dinner together, walking around outside, then coming back to the room and chilling out before we fell asleep around 11:30 pm. Yes, the vacation was absolutely amazing. It was a great time to reflect, rest, and rejuvenate. Grace and I spent quite a bit of quality time together, and I really enjoyed every minute of the vacation. During break I read a book called Kisses from Katie, and it is definitely opening my eyes. The book talks about Katie, who graduates from high school and ends up living in Uganda. She adopts 14 children while in Uganda and learns to rely on God for every need. I want to also learn to completely rely on God and serve His people. Hope College has been a great place for me to grow as a person and experience new opportunities and challenges. There are no words to describe the love and support from the people in the community here. I’m thankful to be here and am excited for new opportunities to arise. Posted on February 17, 2012 September 9, 2013 Author Colleen QuickCategories UncategorizedTags florida, relaxing, winter breakLeave a comment on Sun, Fun, & Florida!